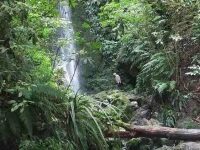 Click here for Antony Hamel’s YouTube video showing his exploration of the 5 falls of Nicols Creek. Neighbours at War Click here for background and photos to the Finnerty Family and their house site on the Moon Track by Nicols Creek. 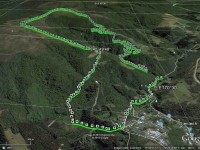 Click Swampy ridge track for background information. Click Pineapple Track for background information. Nicols Creek circuit Maintained by Green Hut Track Group. Booth Road 16.1 km from car park. 22. 28/11/2018. Trampers. 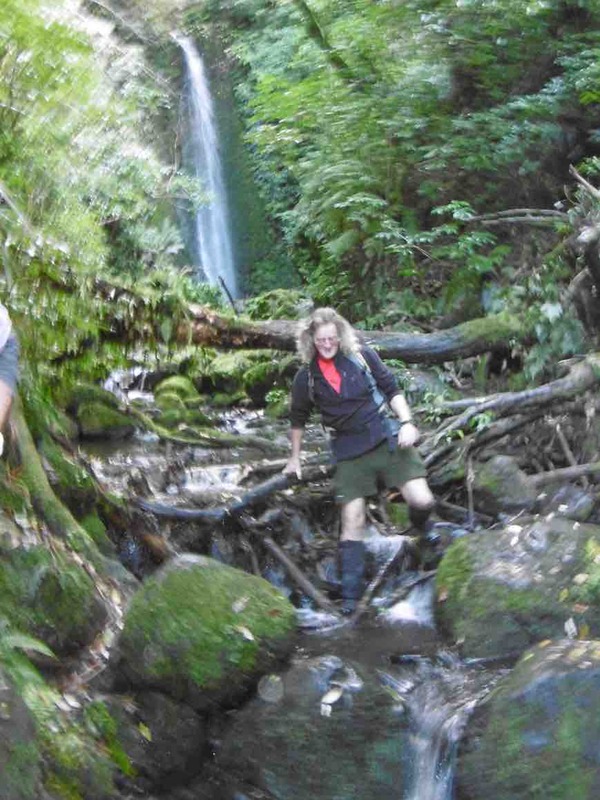 Nicols Falls, Pepper Tree Track, and beyond circuit. M. Leader: Arthur. A cool north-east breeze greeted us when we parked our cars at Booth Road to begin our tramp. The cloud was down on the higher hills, Mt. Cargill for example was hidden to us. There were 7 in our group today, and we began with a one kilometre, or so, road walk before going up to Nicols Falls. 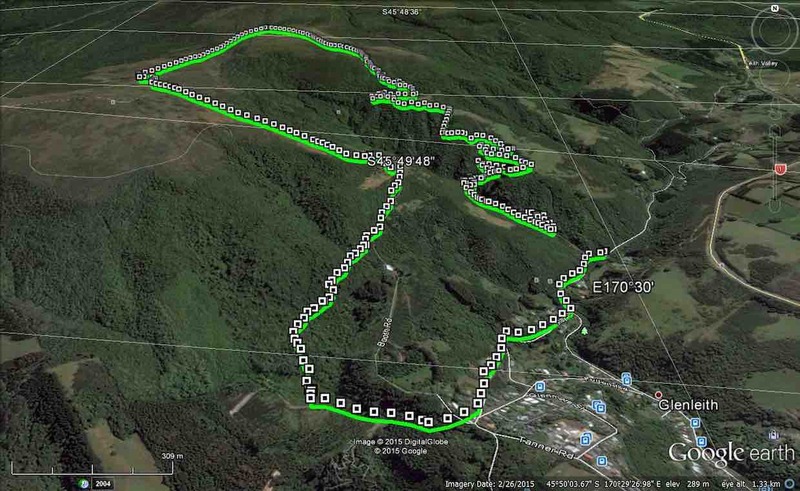 Today’s circuit was to take in some of the older tracks, beginning with Nicols Falls. A short trip was made in to the glow-worms to familiarise all with their location. We stopped to talk to two young Frenchmen who were returning from the falls. 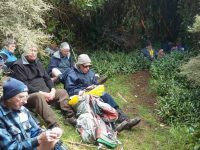 After crossing Nicols Creek we climbed up to have our smoko at Finnerty’s house site. From here the old, original walking track was followed through the area now somewhat spoilt by cycle tracks. 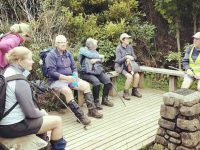 A brief stop was made at the big macrocarpas to admire the rocks, then on up the Moon Track following the old cart track, and then the fence line further up. 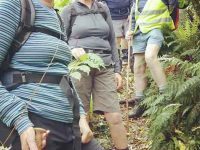 Eventually we turned left onto the Nicols Creek track and followed it to find the junction with the Pepper Tree track, which took us to the Pineapple Track. 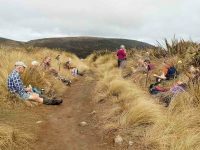 It was getting close to lunchtime now, so going up the Pineapple Track allowed us to lunch in the same spot as we had four weeks ago – only we sat on the other side of the track, as the breeze was from the opposite direction today. … to follow the Original Pineapple Track through the beautiful bush. Conditions underfoot were muddy, as they had been all day, so care was exercised by not hurrying. The old track is worn in places, by many feet and much water, to something resembling a trench. One was saying we were stuck in the groove! before finishing back at the cars at 2 p.m. 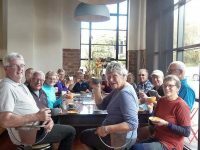 The sun was shining back in Mosgiel on our return, where we Blended in. It had been an interesting and enjoyable day in the bush, with new (to most) tracks to enjoy. – Art. 21. 31/10/2018. Hikers. Moon – Nicols – Pepper Tree – Pineapple – circuit. M. Leaders: Ian and Jim. 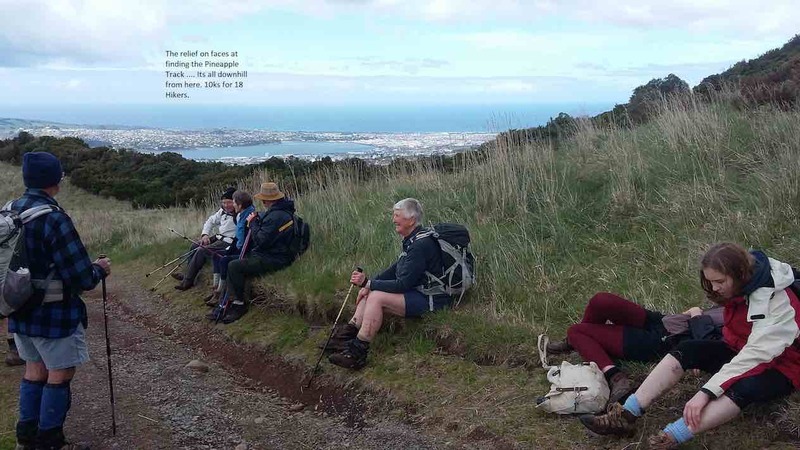 Twenty-one Hikers plus two Ramblers parked at Booth Road. From there they walked down Islay Street to Leith Valley Road and up to Thomson’s Bridge over Nicols Creek. 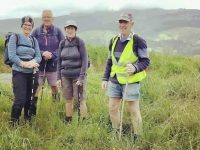 The two Ramblers left to trek on their own account further up Leith Valley Road, with the Hikers setting off up the Nicols Creek Track. A wee way up, we turned off to take the track on the right down to the 14.5 metres high first of the five Nicols Creek Falls for Morning Tea. The promise of the day was to walk the old Moon Track that was there before the Mountain Bikers in 2006 carved it up almost beyond recognition. So after our cuppa, we crossed the creek to climb steeply up on the other side, first to pass by the empty Finnerty’s house site, of which there remains little indication except a flat area alongside the left of the track and a few bricks. 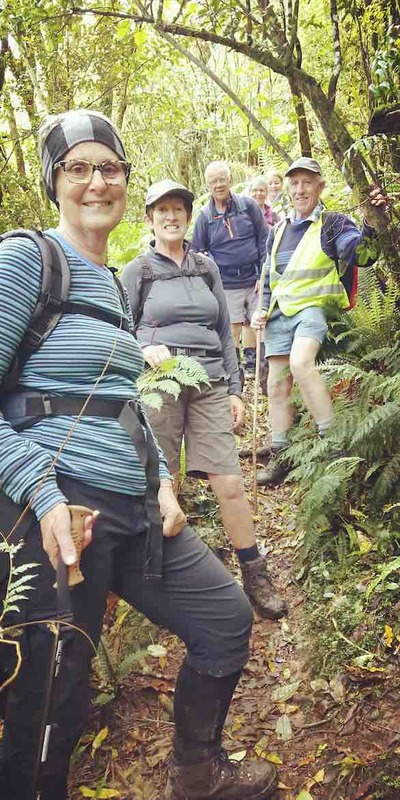 The going was easier now until reaching and crossing the first of the many zig-zag mountain bike tracks to wend our way through bush and over some other zig-zags up to the big boulder clump among some macrocarpas, where we stopped to briefly look around the area. Beyond here the track followed the the old fence through some bush, gorse and grass to come back on another “zig” of the trail. Avoiding the trail above us to the right we took the lower one along to where it dropped slightly to the left. Here we took the route straight ahead. We were back on the old track again. A bit along this one, it swung uphill to the right. Here was the almost straight up, but moderately graded, old cart track that returned us to the fence again, happily avoiding the steep hill on our right in the process. Back alongside the fence again, was a grassy track which first dipped and then rose up and yet up to the corner of the fence’s paddock where there was a welcome table and plank seat to rest on and regroup. Going was now more level but muddier, not helped by the rain two nights ago, but eventually the track led out, over an old large log to the sign posts. One indicated yet father up to Swampy, another indicated our Nicols Creek Track route ahead, and the third back down the way we had come. But on it was the lettering: Moonlight!!! It’s Moon, not Moonlight. Where did the printing instructions get it wrong? Anyway, it was now lunchtime, which made for a leisurely stop. The old cart track, now well wooded in, led us along the the contour across the Nicols Creek headwater tributaries. Again there was that rain-worsened mud In places. A major creek crossing we encountered was through a steep-sided rocky ditch, with the climb-out on the further side one or two paces along a wet but fortunately not slippery rocky forty-five degrees slope and then into a brief dip with a steep drop below before clambering out onto the reassuringly safer part of the track again. We all made it across safely. And then on, across another creek tributary, until we reaching on our right the Pepper Tree Track turn off. This was the junction we had come to a year ago from the other way, when we had climbed the Nicols Creek track from the other end. Well, on then, on the hew track, another creek crossing, and finally gradually up, out of the bush, into grassy area and out onto the Pineapple Track. The intention here had been to complete the original track circuit by crossing over to where the old fence post on the edge of the bush indicated the entrance to the top of the old Pineapple Track. The bush is nice and open, although the track is steep and deeply clay-trenched in places, but today was out of consideration after all the rain we had had lately. The writer has fond memories of it being route to Flagstaff in his youth. But back to the newer track opened in 1975, which we were now on. The cars were at its foot, on Booth Road, waiting to whisk us off to coffee at Sunnyvale. So down we went now, each at our own pace to the bottom. 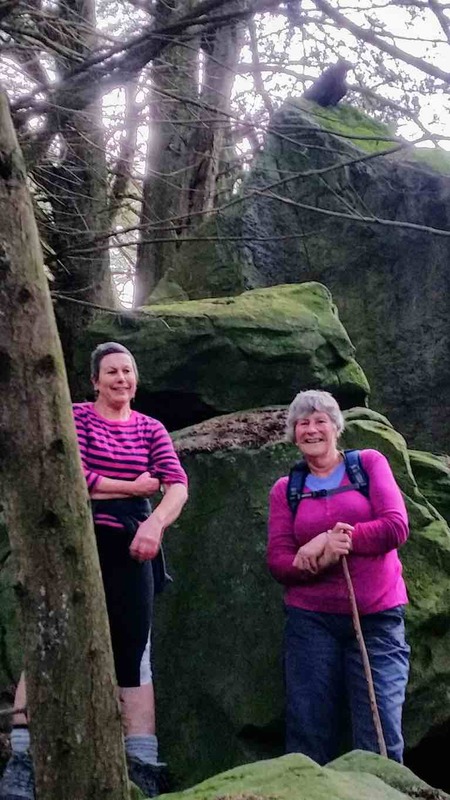 The old track had been a revelation to all but a few older hikers. The most ambitious one for them in a long while. Challenging? Yes. Regrets? No. Satisfying? Yes, – to the writer, especially. Now over to the club to keep this old track alive and back on the programme again. – Ian. 20. 11/10/2017. Hikers. 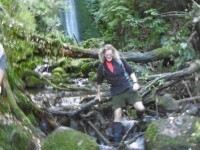 Nicols Creek, Pepper Tree Track, Pineapple circuit. M. Leaders: Ian, Clive. The programmed Deep Creek Tramp was out because of Lambing. Where to go instead? Well, Nicols Creek had not been programmed since 2004, (Except for one calendared for mid-winter but not carried out). So a last minute recce, relying on one old man’s 13-year-old-memory, (helped by an above-listed clickable excellent map q.v. 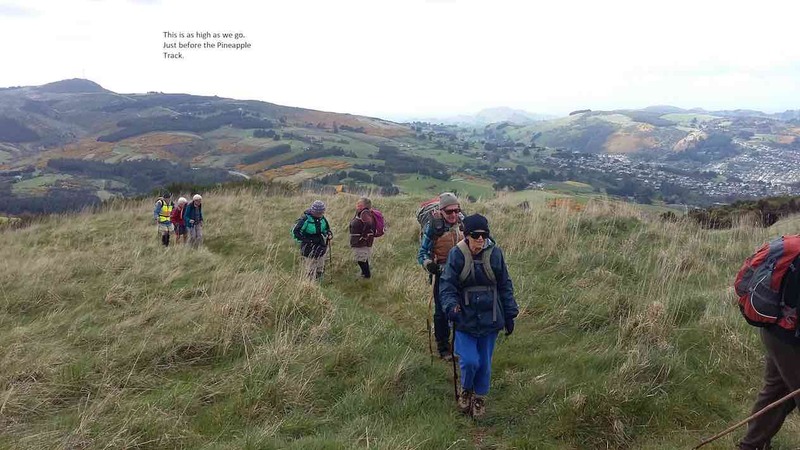 ), rediscovered the route, – a new tramp for most of the club’s current hikers. Contrary to last month’s Trampers’ route, ours was up the Nicols Creek true right side, uncomplicated by the newer Mountain Bikers’ zigzag track on the other side. 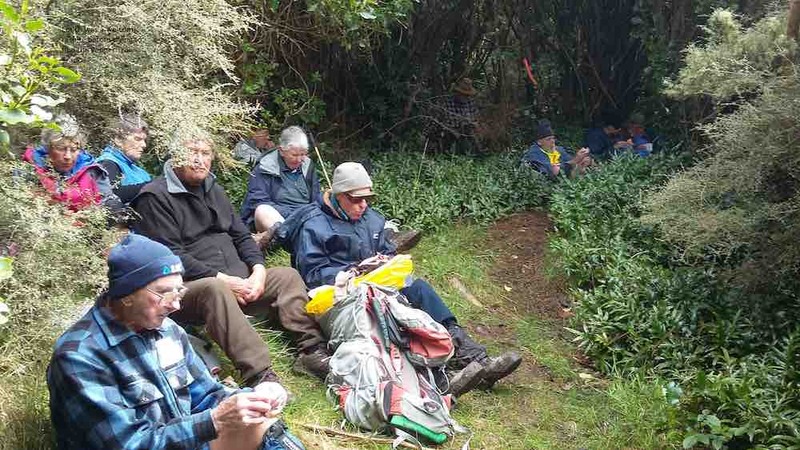 18 Hikers had turned up, after some unnecessary precautions taken by the leaders about helping drivers locate the parking spot. …drinking in the scenery of this local rival to Fiordland’s fabled attractions. 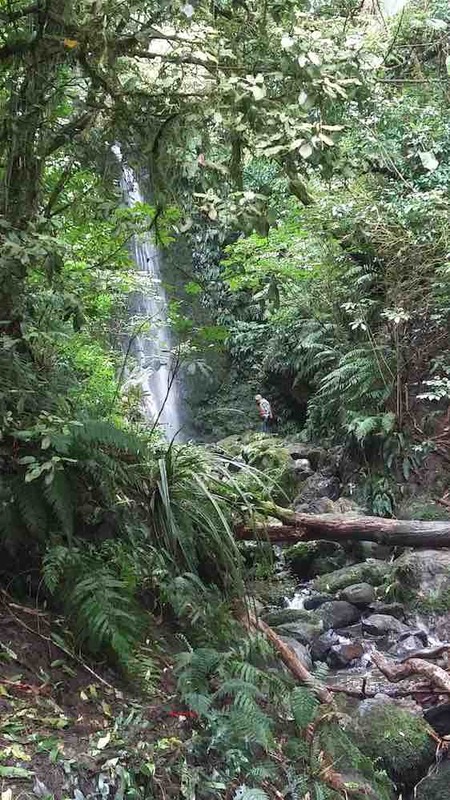 A 15 metre bush waterfall! Refreshed, we forewent the opportunity afforded to us by the track continuing on across the stream that would have led us up the further side and out into the zigzagged area. Such a venture to disentangle the original track from the new zigzags could wait another day. So we returned back out to our original track, which was now taking an easier grade. Soon a fork ahead gave us an option of continuing ahead on the original track or swinging level and wide on a newer one to our left. We took the latter. Both would lead out into open grassland on our left, with our choice swinging out further before returning into the bush. Now it was just steady up and up and up, with many regrouping stops for rest and recovery, but there was plenty of day ahead of us, anyway. Eventually we were on a part of the track that was newer and wider, and that just alluringly continued on straight up. However, an old memory had prompted the writer, on the reece, to turn off this, when discovering an insignificant narrow side track on the right, which he recognised as the actual original track, the other newer one leading who knows where. At this point, stern reminder to the writer! On realising an intended regrouping immediately following the turn-off was proving impracticable due to broom restricting vision, he neglected leaving a guide at the fork for any late-comers. This oversight led to a potentially serious consequence, because a little further along the track, we noticed the absence of 3 of our number. Back-marker Clive went back and eventually found them, returning back down the newer track. They had become distanced from both us ahead and those yet further behind being looked after by Clive, and, seduced by the newer track, had carried on up it, failing to notice the side track’s orange marker, its significance. and with no guide there to prompt them. Reunited again, we went on. Here, the writer’s memory failed him at a critical point. He was looking for yet another fork, this time to the left, and in his mind had pictured it as an obvious T-junction, but which in reality was much less significant, and he led right past it! It was only when descending to cross one of Nicols tributary crossings that he realised his oversight. About turn! Retrace! .. and the leaders did a short reconnoiter of the turn-off and reassured themselves it was indeed the route they had planned. …and onto the wide well-paved Pineapple Track. All downhill now and out onto the Booth Road entrance. A few here opted to wait for Bob to drive back and pick them up. 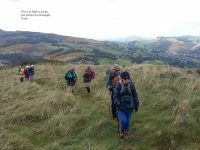 The rest of us carried on, down Islay Street, out onto Leith Valley Road, up past the Old School Building and around a last corner to the Nicols Creek Bridge and the cars. And to the start of the afternoon’s rain! We had completed our 8 kilometre tramp in the dry. 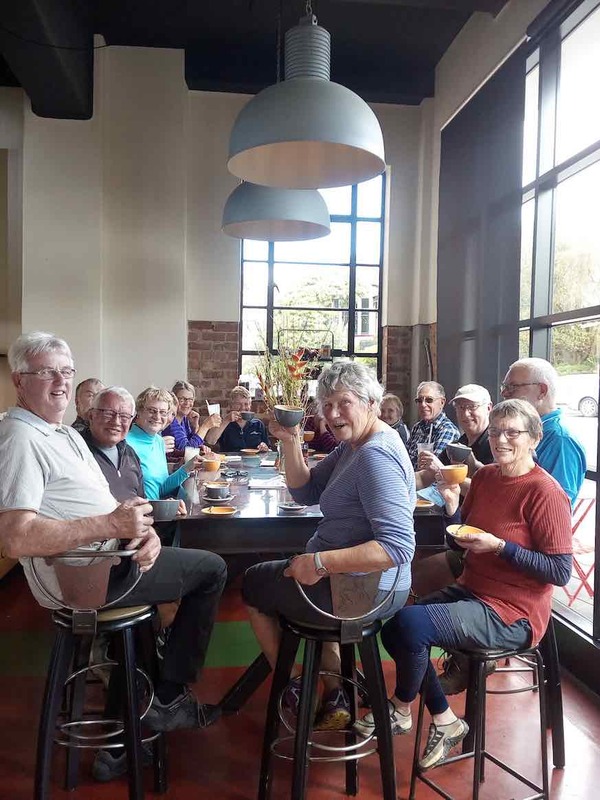 A wet drive to Mosgiel and a coffee-break finish. And behold, just as we were draining our last mugs, in trooped the Trampers, who, poor things, unlike us, had had to finish their tramp in the wet! – Ian. 19. 27/9/2017. Nicols Creek, Pineapple. M. Leader: Jill. 15 trampers set off up the Switchback Nicols Creek Mountain bike track from Leith Valley on a mild overcast morning. 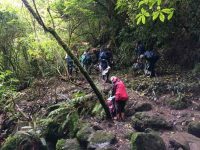 Originally we were going to visit the waterfall but the track was suffering the effects of the recent stormy weather we’ve experienced. The MBT was of a gentle gradient with some very narrow areas following washouts but generally in good condition. 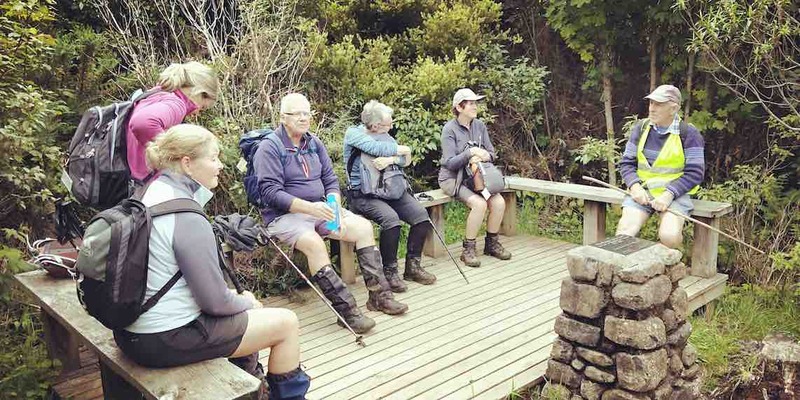 We walked through native bush and often accompanied with pleasant birdsong. (and a big thanks to Eleanor’s Uncle) at the Roslyn fire station. – Jill. 18. 22/4/2015. Trampers. Nicols Creek, Moon Track. 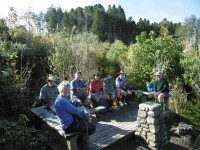 A good turn out of eight trampers, including one new member, met up at the car park on Leith Valley Rd. to start the tramp up Nichols Creek. We walked up to where the glow worms hang out [pardon the pun], but of course there were none to be seen at that hour of the day, so we then went & had a look at the Nichols Falls, which were really quite spectacular, after all the recent rain. We crossed the creek here & made our way up the track on the other side, to find ourselves on the cycle tracks that had been made in this area. The original idea was to go up Nichols Creek, onto Moon Track, then along to the pole line track, & back down there. After making our way up the numerous cycle tracks in the bush above Nichols creek, where none of us really knew where we were going, except we all agreed that UP was the correct way. We eventually found ourselves on what Dermot assured us was the Moon Track, which is badly overgrown, has lots of gorse, & has very deep ruts in it, many containing water, which caught a few members out, as it was very slippery, & easy to slide off the sides into these pools. 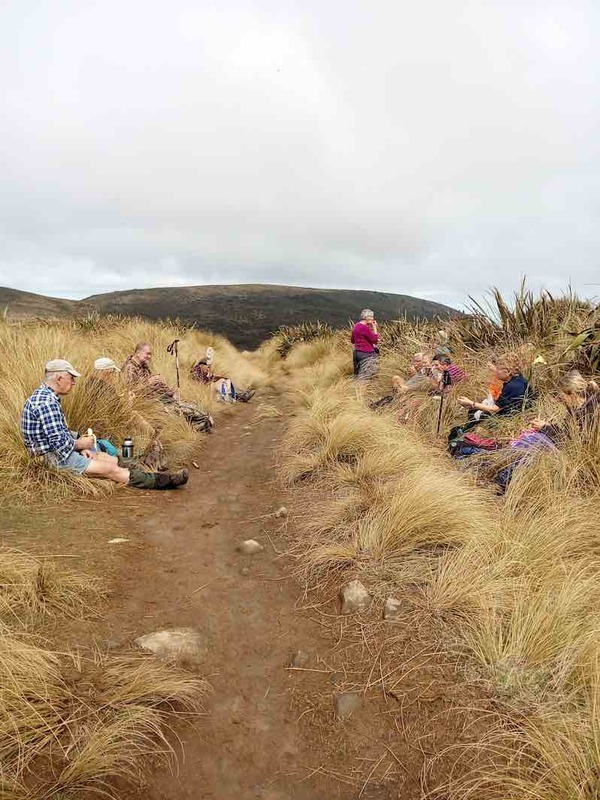 On arriving at the top, at the junction with the Swampy Ridge Track, we had an early lunch, while I contemplated the weather over Swampy, where we would be going. It was completly covered in cloud, almost down to where we were sitting at times, & I decided that it wouldn’t be much fun going that way, so after a consultation, it was decided that we would go over to the Pineapple Track, & back down there. I think this was a good decision, as when we got down to McGouns Track, we went along there to the seating area with the monument, & had a lengthy break sitting in the sun. Then it was back out to the road, & along to the cars. A reasonable day, & a bit of a challenge in places. 17. 22/8/2007. Trampers. Booth Road, Moon Track circuit. Medium. Leaders: Lex, Sabina. 15. 3/11/2004. Both. Nicols Creek, Basin. Leaders: Lex, Ria L, Val and Brian, Irene. 14. 24/9/2003. Hikers. Nicols Creek, Moon Track, Skyline, Pineapple. From Booth Road. Medium. Leaders: Donny, Irene. 13. 27/11/2002. Both. Nicols Creek, Moon Track, to Skyline. Medium. Leaders: Irene, Ria L, Eleanor, Joyce. 12. 17/3/1999. Nicols Creek, Basins. Barbara McC, Sabina, Irene. 11. 20/2/2002. Alt. 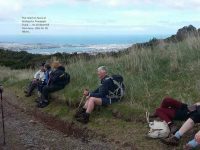 Nicols Creek – Moon Track to Skyline Track. Start Booth Road. Medium+. Leaders: Betty, Denise. 10. 27/1/1999. 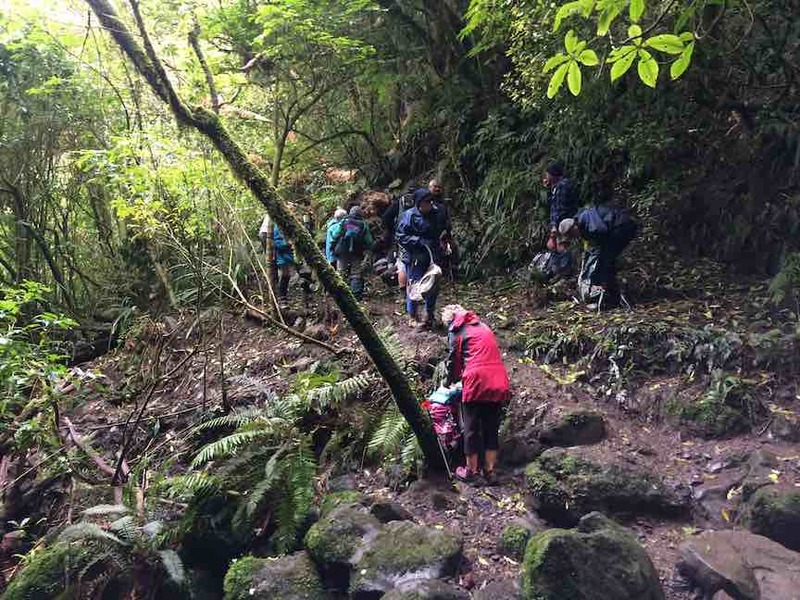 Pineapple Track – Swampy area. Leaders: Shirley R, Lance and Lois. 9. 28/5/1997. Leith Valley, Nicols Creek return Skyline. Leaders: Bob H, Bev H, Molly. 8. 9/10/1996. Nicols Creek, Basins from Booth Road. (Park Booth Road.) Average. Leaders: Jack R, Dot T, Patricia J. 7. 18/10/1995. Nicols Creek, Swampy. Medium. Leaders: Jack R, Barbara McC, Mairie and Doug. 6. 6/7/1994. 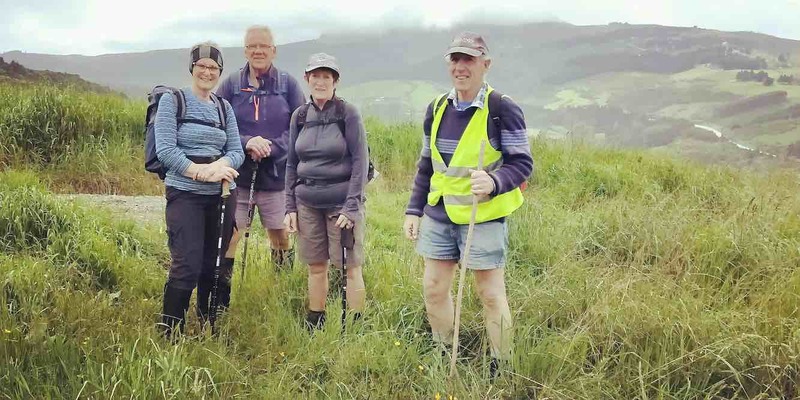 Nicols Creek/Moon Track, Alternative – Pineapple Track. Medium. Leaders:Nancy, Bob H, Shirley R, Joyce. 5. 27/5/1992. Nicols Creek from Booth Road to Swampy Pineapple. Average. Leaders: Marie, Nel, Les W, Margaret D.
4. 3/7/1991. Pineapple Track carpark round snow trip. Wrap up well for this mountain trip. Average. Leaders: Jack M, Mary McG, Bev McI, Shirley. 3. 6/6/1990. Pineapple carpark round trip.Average+. Leaders: Marie, Mary McG, Shirley, Helen. 1. 26/7/1989. Swampy round trip from Pineapple Track carpark. Average+. Great views. 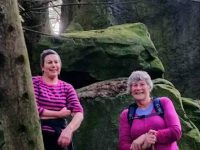 Leaders: Denise P, Mary McG, Peggy M.